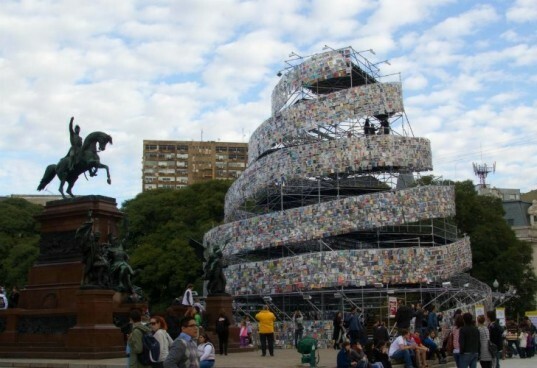 Buenos Aires was named the 2011 World Book Capital, and in honor of that title artist Marta Minujin has erected a Tower of Babel using 30,000 books donated from all over the world. The historical Tower of Babel, which was said to reach the heavens, was part of a story to explain the origin of languages. While the Argentinian book version doesn't quite meet the heaven mark, (it's only 25 meters tall), the spiraling tower certainly provides fantastic views of the city and is bringing together the written word in various languages and helping to unify people. 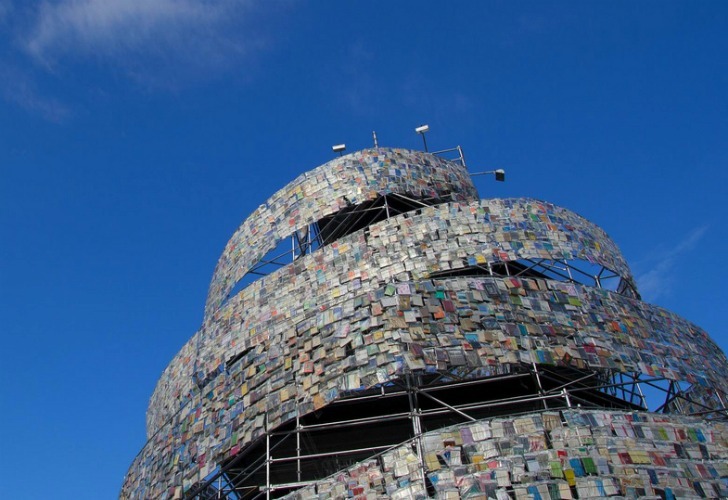 Built in San Martin square, the book version of the Tower of Babel spirals up 25 meters into the air affording visitors with spectacular views of the city. The seven story tower is covered in 30,000 books donated by readers, libraries and more than 50 embassies. Children’s books hang next adventure stories, comic books, collections of poetry and more, all in different languages. This unification of the written word in one location is reminiscent of the original Tower of Babel, where everyone spoke the same language. Visitors ascending the tower hear music composed by Minujin and the artist repeating the word ‘book’ in many languages. Minujin said her role as the artist of this installation was to “unite all people”. The book sculpture will be up until May 28th when it will be dismantled and literary enthusiasts will be invited to pick one book to take home with them. The remaining books will begin an archive called The Library of Babel, after the Jorge Luis Borges short story. Built in San Martin square, the book version of the Tower of Babel spirals up 25 meters into the air affording visitors with spectacular views of the city. The seven story tower is covered in 30,000 books donated by readers, libraries and more than 50 embassies. Although the books hang in plastic bags, this is to keep them from getting destroyed in case of rain. Children's books hang next adventure stories, comic books, collections of poetry and more, all in different languages. This unification of the written word in one location is reminiscent of the original Tower of Babel, where everyone spoke the same language. Visitors ascending the tower hear music composed by Minujin and the artist repeating the word 'book' in many languages. Minujin said her role as artist of this installation was to "unite all people". The book sculpture will be up until May 28th when it will be dismantled and literary enthusiasts will be invited to pick one book to take home with them. The remaining books will begin an archive called The Library of Babel, after the Jorge Luis Borges short story.